Hector Aristizabál is a Colombian theatre maker, therapist and activist. He is currently based in Los Angeles where he is artistic director of Imaginaction. 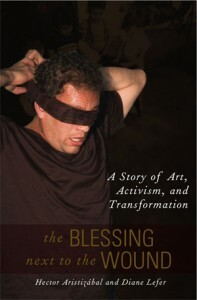 He is co-author of The Blessing Next to the Wound: A Story of Art, Activism and Transformation. All activities will be in English. Don't miss the unique opportunity to work with an internationally acclaimed Theatre of the Oppressed practitioner. 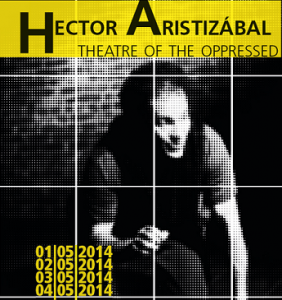 Hector Aristizabál is een Colombiaans theatermaker, therapeut en activist. Hij leeft momenteel in Los Angeles waar hij artistiek directeur is van Imaginaction. Hector is mede-auteur van The Blessing Next to the Wound: A Story of Art, Activism and Transformation. Alle activiteiten gaan door in het Engels. Mis deze unieke kans niet om te werken met een internationaal gerenommeerde specialist in Theater van de Onderdrukten. Hector was born and raised in Medellín, Colombia when it was the most dangerous city in the world. One of his brothers was seduced by the power of crack cocaine and another by the promises of revolutionary armed struggle. Hector’s path was different. He worked his way out of poverty to become a theatre artist and pioneering psychologist with a Masters degree from Antioquia University, then survived civil war, arrest and torture at the hands of the US-supported military. In 1989, violence and death threats forced him to leave his homeland. In exile, Hector struggled to overcome his rage and desire for vengeance and to channel these energies instead into constructive social action. He founded ImaginAction to help people tap the transformative power of theatre in programs throughout the US, Latin America, Europe and around the world, as far afield as Afghanistan, India, and Palestine, for community building and reconciliation, strategizing, and individual healing and liberation. Through experiential workshops, theater performances and other creative events, ImaginAction invites participants to explore embodied knowledge, challenge the inevitability of violence, and use their imaginations for a more just and joyous life for all people. He has served on the core council of the Colombia Peace Project-LA and on the boards of the Program for Torture Victims and of Pedagogy and Theatre of the Oppressed, a global forum for social justice based on the ideas of Paulo Freire and Augusto Boal. ImaginAction Theater Inc. is a non-profit theatre arts organization based in Los Angeles, California, but our workshops and performances travel the world. Our work has been influenced by Theatre of the Oppressed, Playback Theatre, Theatre of Witness, Psychodrama, traditional storytelling, mask-making, drumming, dance and creative ritual. Forumtheater “Droog Zaad” – 6 maart, Gent LABO vzw lanceert Back to Rural!